Penned by one of America's best-known daily theatre critics and organized chronologically, this lively and readable book tells the story of Broadway's renaissance from the darkest days of the AIDS crisis, via the disaster that was Spiderman: Turn off the Dark through the unparalleled financial, artistic and political success of Lin-Manuel Miranda's Hamilton. It is the story of the embrace of risk and substance. In so doing, Chris Jones makes the point that the theatre thrived by finally figuring out how to embrace the bold statement and insert itself into the national conversation - only to find out in 2016 that a hefty sector of the American public had not been listening to what it had to say. Rise Up! 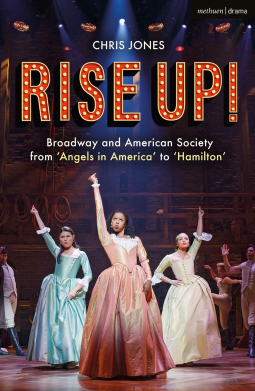 is a wonderful tome that investigates how Broadway has influenced, and been affected by, culture, politics and social values over the last thirty years. By highlighting certain productions, it tells the story of societal development and changing attitudes since the 1990s, and how these have related to the types of productions seen on the stage. I knew most, but not all, of the shows referenced, and found it an interesting and informative work. This is a book that will appeal to theatre lovers who enjoy a more thought-provoking approach to theatrical commentary. Definitely worth a read!